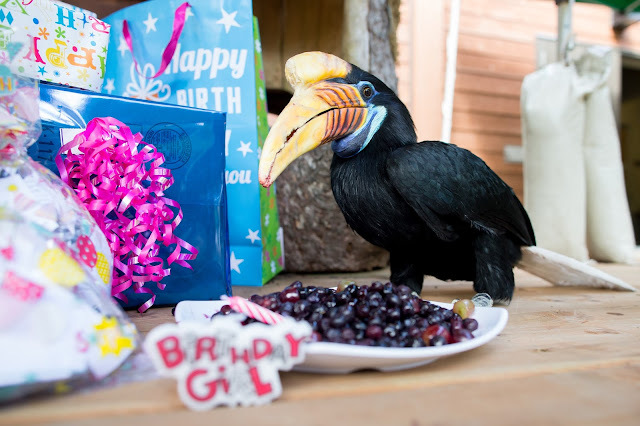 Woodland Park Zoo Blog: Happy 20th birthday to hornbill Blueberry! It’s a milestone year for one of our long-time residents. 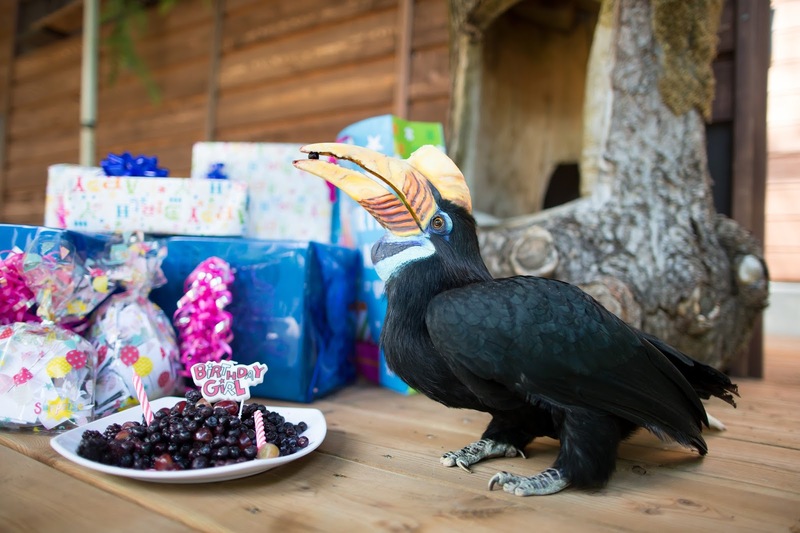 Blueberry, our beloved knobbed hornbill, celebrates her 20th hatchday (that’s bird speak for birthday) on Sunday, May 7, 2017. You can stop by the Friends by Nature program at the Alvord Broadleaf Theater that day (11:00 a.m. and 2:30 p.m.) to wish Blueberry a happy 20th! Video: Happy Birthday Blueberry! Blueberry enjoys some of her favorite treats:blackberries, grapes and, of course, blueberries. 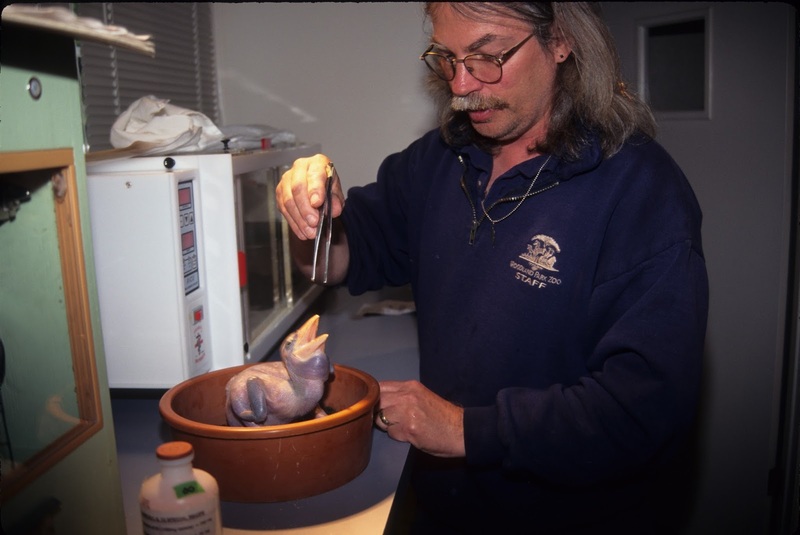 It’s hard to believe it’s been 20 years since Blueberry hatched right here at Woodland Park Zoo. Just think, in 1997 Notorious B.I.G.’s “Hypnotize” and Hanson’s “MMMBop” were at the top of the Billboard charts and “The Fifth Element” and “The Lost World: Jurassic Park” ruled the box office. My how time flies. Turning 20 isn’t the only thing Blueberry is celebrating; the hatchday girl is also a new member of the ambassador animals all-star team at the zoo and can be seen regularly in the Friends by Nature program at the Alvord Broadleaf Theater this summer! With all of Blueberry’s big milestones, we wanted to share some other fun stories that make her unique. And who better to get those stories from than her two best friends, zookeepers Eric Kowalczyk and Regina Smith. WPZ: How long have you known Blueberry? Eric: Since she hatched, I was her primary keeper. After she fledged (left the nest), Blueberry was brought into one of the off-view Conservation Aviary so she could be monitored more closely. I worked with her every day so we developed a very close relationship. That was until I retired earlier this year and passed the reins to Regina. Regina: Before Eric retired, he had started looking for keepers to work with Blueberry, since I’d worked with him before he tried me out for the potential role of Blueberry’s new best friend. I have to say that I was a bit nervous knowing her preference for Eric, but lucky for me, Blueberry decided that I was OK, and we started building a relationship. Eric feeds a very young Blueberry! Photo from Woodland Park Zoo archives. WPZ: How did Blueberry get her name? Eric: I wanted to name her “Blueberry” (after her favorite treat) in Indonesian, since that’s where knobbed hornbills are from. It turns out there is no word for “blueberry” in Indonesian, and naming her something close to that in Indonesian would’ve been really long and complicated! So I started calling her “Blue berry” and it caught on. Regina: We usually go with “Blue” for short. WPZ: How did you prepare Blueberry for her public programs? Regina: For many years, Eric did keeper talks on zoo grounds with Blueberry while she wore falconry equipment which allowed her to safely travel to and from her enclosure and reduce the risk of her flying away. Last year, when we started training her to be part of the ambassador animals program, we made some changes to her daily routine (including removing her falconry equipment); she’s adjusted to the changes quite well. We ask for Blueberry to do and try a lot of new things, and she’s always shown that she’s up for the challenge. In fact, she learned her 2017 Alvord Broadleaf Theater routine in one session! WPZ: Can visitors see Blueberry on exhibit outside of the ambassador animals programs? Regina: No, Blueberry injured her leg last fall and after that she came to live at the ambassador animals unit off exhibit full-time where she could have a comfortable, warm place to live that was near Conservation Aviary (where she lived on exhibit). Before Eric retired, he would come visit her three to five times a day to feed her and do physical rehab sessions with her to rebuild muscle tone in her leg. Now she’s doing great, her leg has gained back muscle tone and she is moving around more normally. But we’ve decided to keep her off exhibit and let her rest and relax when she isn’t doing physical rehab, training for or participating in the ambassador animals program. This bird knows how to party! Photo by Jeremy Dwyer-Lindgren/ Woodland Park Zoo. WPZ: Many of our members and regular visitors know Blueberry by name. Why do you think she’s been such a successful ambassador? Eric: For me, she has been a very good bird. She was great with the public and was perfect for giving educational talks. I always looked at her as a means to spread conservation messages. Besides, she liked the attention that we gave her (at least I think she did). She would be a perfect “ambassador” for the species. WPZ: What’s it like being Blueberry’s new best friend? Regina: Blueberry is still excited to see Eric when he finds time in his retirement to pop by. She’s transitioned well to working with me and the ambassador animals team; she’s been wonderful and completely engaged in her training sessions. I make it a priority every day to spend time with her doing the things she enjoys most: sitting out on the Broadleaf stage in the sun, allopreening (aka head scratches), and taking her for rides in her crate–she loves it when we go off-roading, the bumpier the better! Twenty years later, Blueberry is as big a star as ever. We can’t thank her enough for the smiles, laughter and hundreds of stories she’s provided us. Adopt a nest: Hornbills are the builders of rain forests, consuming a variety of fruit and then dispersing the seeds throughout the forest. Because of the important ecological niche they occupy, hornbills are considered a keystone species. As forests are cleared for agricultural uses and illegal logging, these magnificent birds are increasingly under threat. Woodland Park Zoo has had a long relationship with Dr. Pilai Poonswad, a hornbill researcher in Thailand who founded the Hornbill Research Foundation (HRF). HRF works to help the people who share the habitat by employing them to protect hornbills and their nests. 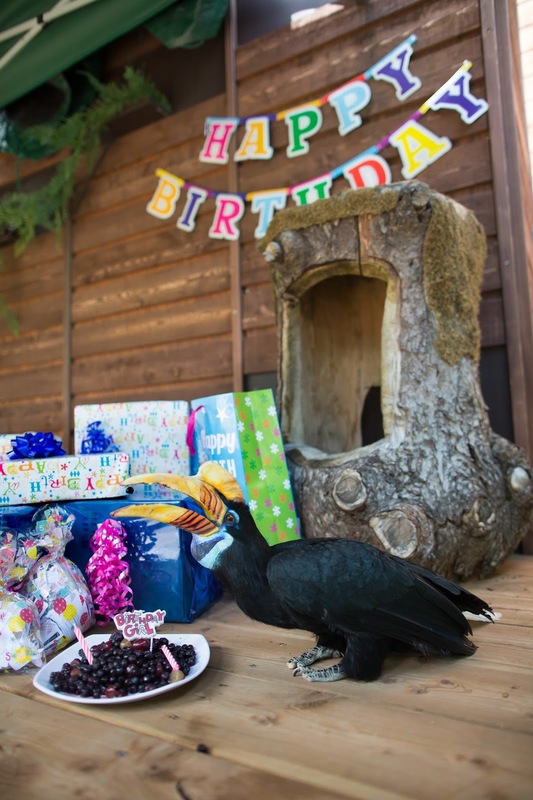 Help Woodland Park Zooprotect hornbills by adopting a nest. 1 fig (quartered) Did you know that wild hornbills prefer figs? 1 passion fruit (scrape yellow seeds from white skin) Passion fruit is found all over in Indonesia! Place all ingredients (except starfruit and coconut flakes) in a blender. Add a few ice cubes to make extra refreshing. Blend until fairly smooth. Place sliced star fruit on top for an extra fancy touch. Blueberry recommends adding coconut flakes if that is your thing.